Mohawk's Hillsborough Collection features beautiful designs with unique texture on a 3/8 in. thick engineered hardwood platform. Backed by a 25-year residential finish warranty and lifetime structural manufacturer's warranty, you can depend on this flooring for years to come. The joint locking system provides a secure, easy and quick installation process. Mohawk products are made with the highest standards in manufacturing, achieving unmatched quality and detail in every plank. The Hillsborough Collection meets all environmental standards and is CARB II and Lacey Act compliant. California residents: see Proposition 65 Information. 28.25 sq. ft. per case and case weight: 41 lbs. Buy online Mohawk Hillsborough Hickory Charcoal 3/8 in. Thick x 5 in. 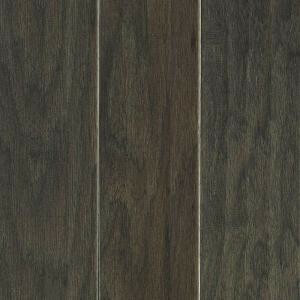 Wide x Random Length Engineered Hardwood Flooring (28.25 sqft./case) HEC59-17, leave review and share Your friends.